I grew up eating salad as a side with spicy Indian food. Be that dum alu or Chittagong chicken, salads were always on the side line. But coming here, and living in the US for almost 4 years now, the take on salad has almost changed, from being a side dish salad has now turned into a meal. Over the years I have started liking the abundance of greens in my salad (read loads of spinach, arugula and how can I forget iceberg lettuce), but when it comes to touching your roots a medley of cucumber, tomatoes and onion always seals the deal. 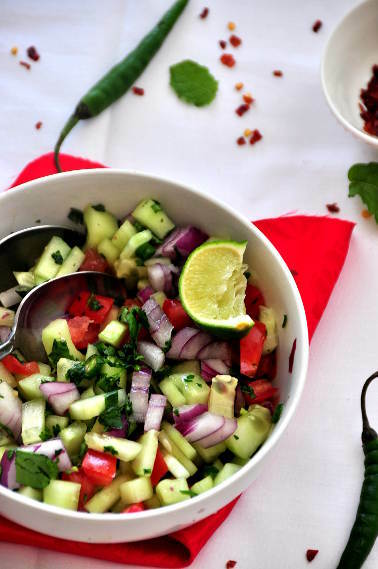 Mexican pico de gallo comes very close to this garden fresh North Indian green salad, but the vegetables are cut in a little larger size and when its Indian it has to spicier. 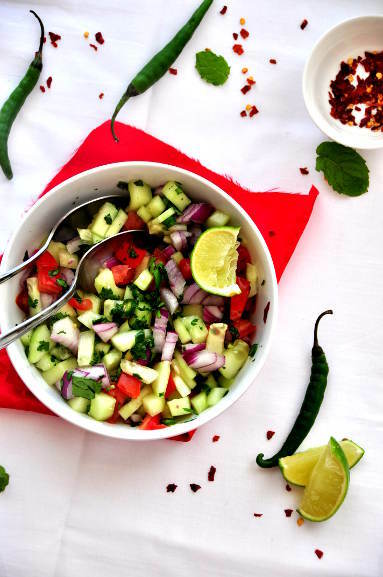 Generally, cucumber, onions and tomatoes are the main ingredients in this salad, but tamarind is also mixed sometimes to give it a more tangy taste. And, if you want, you can also add a portion of yogurt to make dahi raita. The quantity of ingredients depends entirely on you, it doesn't matter if you use 3 cucumbers instead of 4, if it tastes good to you, that's what counts.